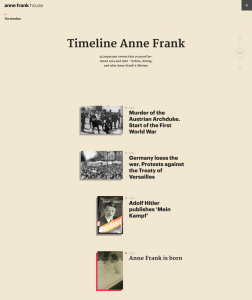 The website offers the opportunity for a meaningful experience of the life story and writing of Anne Frank. Visitors are invited to reflect on the history and discover the museum collection, supported by professional research. The website is a necessary tool to communicate with visitors buying tickets online and finding their way to the museum. It attracts 4.5 million users a year. 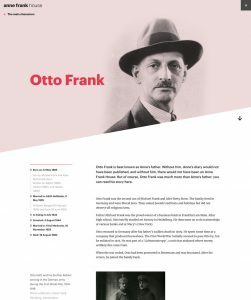 During the redevelopment of the Anne Frank House website, it was hugely important to develop a platform that is easily accessible on all types of devices anywhere in the world. 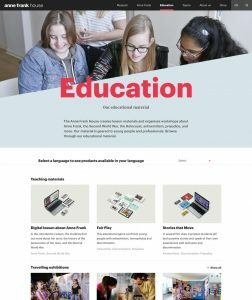 Robust technical infrastructure, engaging design, excellent user interaction and clear creative vision were key for this. 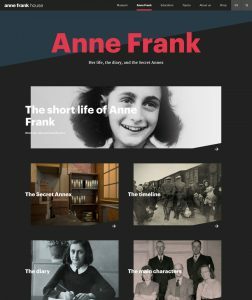 The Anne Frank House believes that it has succeeded with these goals, thanks to the work of DOOR, the culture label of the Dutch creative digital agency IN10, and developers from Maykin Media. Functional and task-oriented: users can easily find what they are looking for. 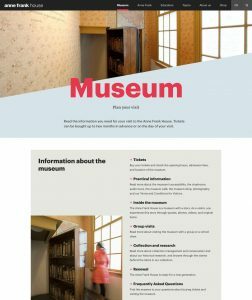 Information is offered in a clear, concise and powerful way, not just about the museum and ticketing, but also educational programs and activities. 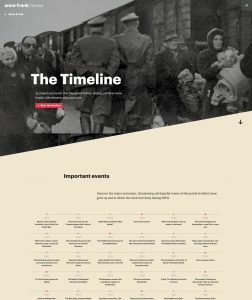 The aim is to bring the story of Anne Frank and the Second World War to life in a penetrating way through digital immersive storytelling. 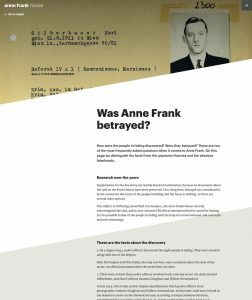 We use a virtual reconstruction of the Secret Annex and present a timeline, a who-is-who and information about Anne Frank’s diary.